Today is the birthday of a very famous Cuban watchmaker, Gedalio Grinberg, born in born in Quivicán, Cuba on September 26, 1931. Grinberg escaped from Cuba soon after the Castro revolution became a dictatorship of its own and he settled in New York, where he began to sell watches. After reading Vance Packard's 1959 book, The Status Seekers, and its message of how American's were increasingly looking to project their status, Grinberg realized that he could convince Americans that wearing a quality watch was as much of a status symbol as owning a Cadillac in one's driveway. A 1988 Forbes profile cited by The New York Times described how "Grinberg helped make Americans conscious of their watches and made the glint of gold on a male wrist a status symbol" changing the American perception of a watch as a gift one received for their high school graduation. As part of an effort to combat Japanese watchmakers, Grinberg invested in ultrathin quartz watches, culminating in 1980 with the Concord Delirium IV, which at 0.98 millimeters thick was the first watch thinner than one millimeter. 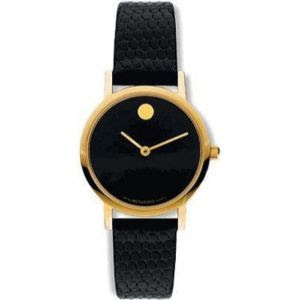 After acquiring the Movado in 1983, the firm was renamed the Movado Group. Under Grinberg, Movado heavily promoted the "Museum Watch" a modernistic markless black face with a single gold dot at the 12 o'clock position based on a design by Nathan George Horwitt in the collection of the Museum of Modern Art, selling millions of the watches in dozens of different versions.